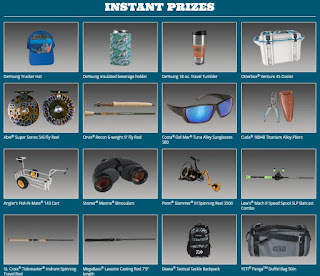 Grizzly Fishing With a Mission Instant Win Giveaway - 896 Winners. Win Fishing Rods and Gear, Sunglasses, Binoculars, Tumblers, Coolers, Bags and More. Daily Entry, Ends 7/31/18. VOID IN MA, MI and VA. GOOD LUCK!! GRAND PRIZE DETAILS: One (1) Grand Prize winner will receive a boat, a trailer, and a boat wrap. Grand Prize winner can choose one of the following options: Option 1: Carolina Skiff® 24 Ultra Elite with 200 HP Motor and trailer (ARV: $68,068.00) and a boat wrap (ARV: $3,500.00). Total ARV for option 1: $72,568.00. Option 2: Z520C Ranger Cup® with Mercury® OptiMax® 250 Pro XS and trailer (ARV: $67,995.00) and a boat wrap (ARV: $3,500.00). Total ARV for option 2: $71,495.00.